I've wanted Hunter rain boots real bad for awhile. It doesn't matter that I'm certain they're too tall for my lil legs, and that anything that goes over my calf needs to be tried on before it's purchased, I want em. Anybody who needs calf implants, I'm willing to donate. That would alleviate the whole yes, I'm 5'1 and need to purchase "wide-calf" boots issue. My calves are legitimately the circumference of some friends thighs. A male friend who was voted "best legs" in high school and I have the exact same legs, proportionally. I don't think men and women's legs are judged on the same criteria. By themselves, I don't think they look bad, they're just muscley... but for fall-boot season? They might as well be sumo wrestler calves. I digress. 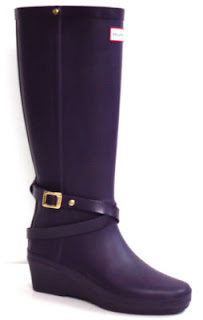 I got these on Gilt and I'm going on a calf diet. And they even have wedges so I don't look like a midget! Now advice on how to make my legs less muscley would be appreciated.